Close-up of a flowering Goldenseal (Hydrastis canadensis) plant. 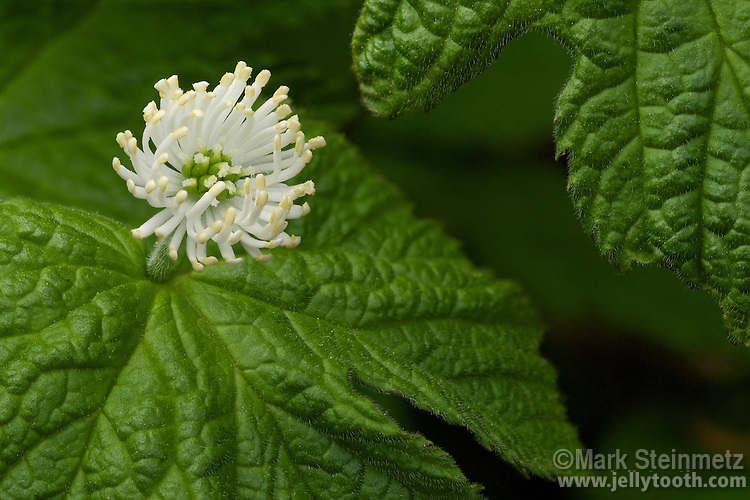 The flowers of Goldenseal have no petals, and the sepals fall off upon the flower opening. The attractive flower is composed of many white stamens surrounding a cluster of pistils. The roots of the plant are a highly valued medicinal with antibiotic, antiseptic, and immune-system stimulating properties. Goldenseal is a threatened species due to over-harvesting in the wild. Native to eastern North American woodlands. Delaware County, Ohio, USA.